When someone asks, "Will you make me a cake? No occasion. Just because." I love those people. It's rare to be handed creative freedom, especially with something so personal as cake. Indulging in desserts isn't something we do everyday (unless you're me), so when we do, we tend to want very specific flavors. Typically it's chocolate, with peanut butter, drizzled with homemade salted caramel, topped with a rich velvety buttercream that makes your head spin. Yes, I'm talking about me again. Today, a friend asked for a "just because" cake and gave me no specifics. She said, "Make whatever you want. I just want to eat it." Even with the finishing decorative touches, she had no input. She simply wanted cake. Just because. I literally jumped with joy, as nothing makes me happier than a blank canvas. 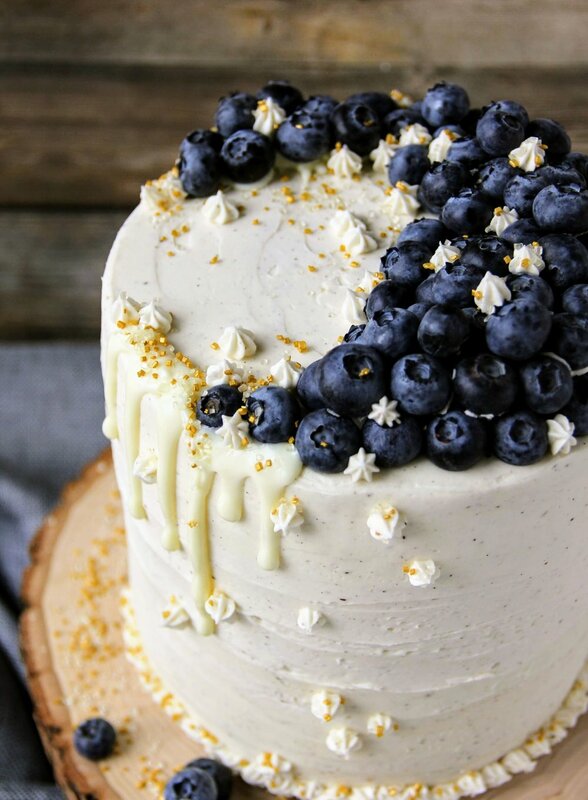 To me baking a cake is exactly that, a canvas. It's a chance to seek out inspiration, play with ingredients, and create something delicious and beautiful. 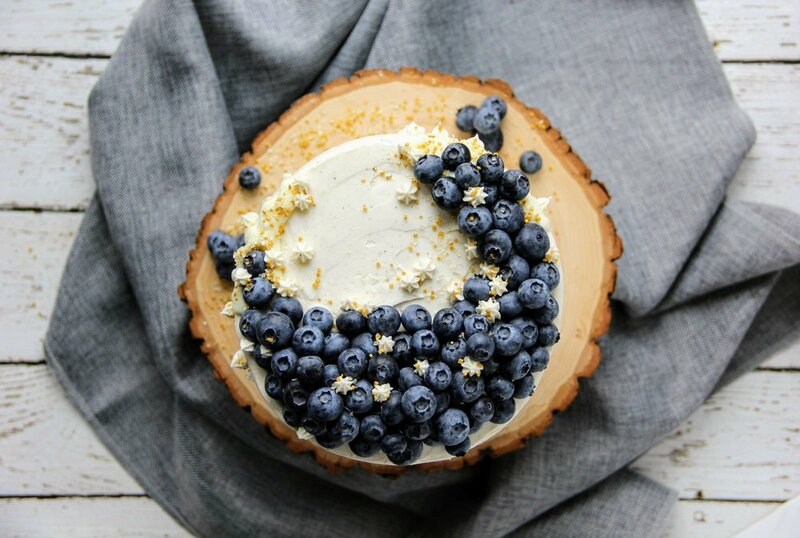 Today's inspiration came from a container of fresh blueberries, a delicious Stonewall Kitchen Wild Maine Blueberry Jam, scraped vanilla bean, and Van Gogh's "Starry Night". Yes, believe it or not, all these things, in my mind, came together as a cake. Delicious it was...and beautiful. My love for Van Gogh dates back to my days in high school. I was an art student, and a wandering romantic. Naturally, Van Gogh's dreamy, vibrant, and whimsical paintings touched my heart, making me feel that while I may be wandering, I was not lost. His "Starry Night" was especially moving to my teenage heart. It hung on my wall for years, reminding me that adventure was out there, and one day it would be mine. 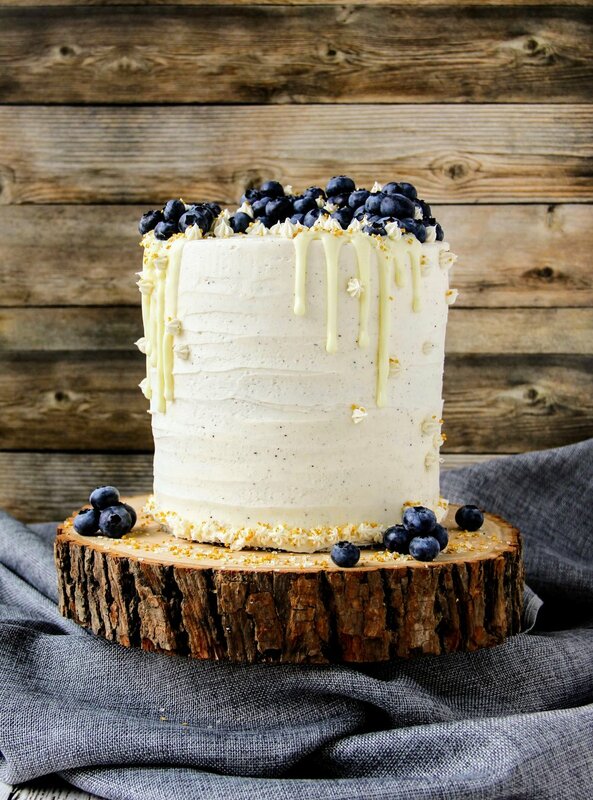 Jewel toned, tangy blueberries and perfectly sweet Wild Maine Blueberry jam, mixed with a rich, textured vanilla bean buttercream, and finished with gold and crystal sprinkles filled my blank canvas. It's an inspired "just because" cake with an impressionistic art twist. A masterpiece! You may not see it as I do, but as they say, art is subjective. And in this case, absolutely scrumptious. Preheat your oven to 350°F. Butter and flour three 6" round pans. In a large bowl, cream sugar and butter, on medium high speed, till light and fluffy. About 3-5 minutes. On low speed, add vanilla and eggs, one at a time. Mix till combined, scraping the bowl as needed. On low speed, add 1/2 of the dry ingredients, followed by 1/2 of the buttermilk. Repeat. Mix until smooth but do not over beat. In a small bowl, mix the blueberries with 2 tablespoons of flour. Stir into the batter. Divide the batter evenly between prepared cake pans. Bake on middle rack for 30-35 minutes, till a tester comes out clean. Allow to cool for 10 minutes. Transfer to a wire rack to cool completely. With a handheld or stand mixer fitted with a paddle attachment, beat the butter on medium speed until smooth and creamy, about 2 minutes. Add powdered sugar, one cup at a time, beating until smooth. Mixing on slow speed, slowly add the heavy cream, pure vanilla extract, vanilla bean scrapings, and salt. Mix on medium-high speed for 3 full minutes till light and fluffy. Add more powdered sugar if the frosting is too thin or a touch more heavy cream if the frosting is too thick. Place one layer of cooled cake, flat side down, onto a serving plate. Top the layer with a generous scoop of vanilla bean frosting. Spread evenly to the edges. 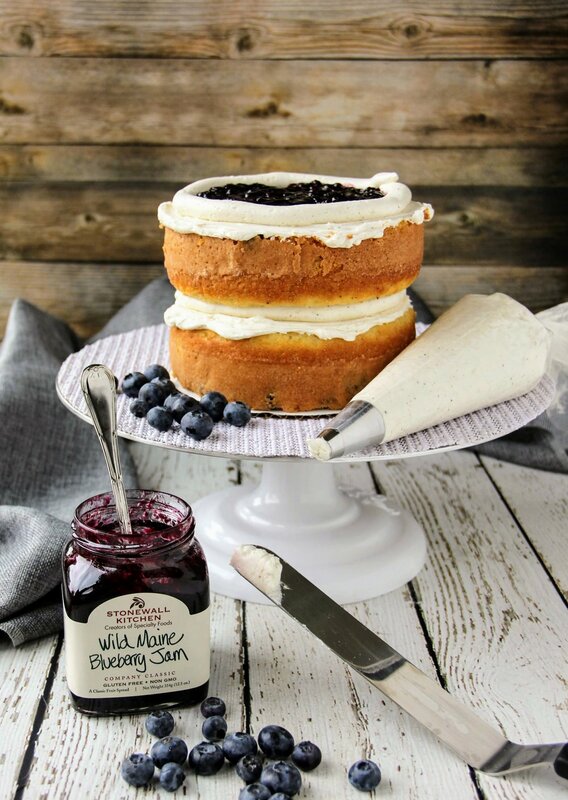 Add a heaping tablespoon of jam, swirling it into the frosting. Sprinkle with fresh blueberries. Repeat with the second cake layer. Add the final layer, flat side up. Apply a crumb coat and allow to set in the fridge for 10 to 15 minutes. Use the remaining frosting to cover the entire cake. 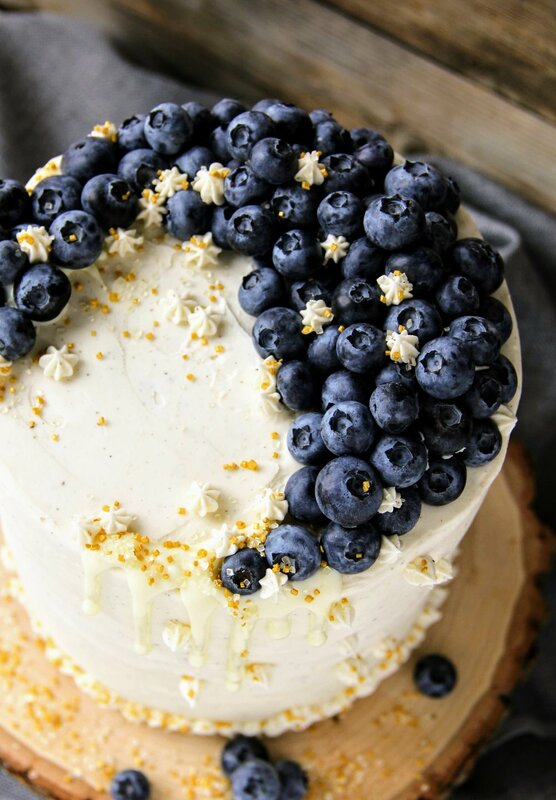 Top with more fresh blueberries, and gold sprinkles, if desired. Serve at room temperature. Cake can be made one day ahead, keep covered in fridge.